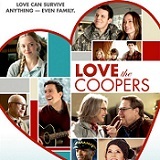 Academy Award winners Alan Arkin (Best Supporting Actor, Little Miss Sunshine, 2006), Diane Keaton (Best Actress, Annie Hall,1977), and Marisa Tomei (Best Supporting Actress, My Cousin Vinny, 1992) team up to rediscover the power of love across every generation in Love the Coopers. 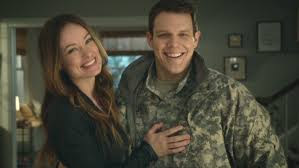 The heart-warming comedy that reminds audiences what family is all about also stars Golden Globe winner John Goodman (Argo), Ed Helms (The Hangover), Jake Lacy (Carol), Anthony Mackie (The Hurt Locker), Amanda Seyfried (While We’re Young), June Squibb (Nebraska), and Olivia Wilde (TRON: Legacy). When four generations of the Cooper clan gather for a reunion, a series of unexpected visitors and unlikely events turn the night upside down—leading the Coopers toward a joyful rediscovery of family bonds and the magic of love. The Cooper family, like every family has its issues. From the patriarch to his daughters, to their children and grandchildren, no member is immune. Sam (Goodman) and Charlotte (Keaton) Cooper are hosting Christmas for their family. After 40 years of marriage, they are on the verge of divorce, but agree to keep things civil and not tell their family. They want to have one last Christmas together. As they try to make it through the day preparing for the holiday and at the same time, watching their granddaughter, we see that they are barely holding it together. Hank Cooper (Helms) is a divorced father of three, who has lost his job as a photographer at a department store. His Christmas Eve is spent on job interviews and trying to figure out what he’s going to do with his life. He needs to pay alimony and child support and also buy the kids Christmas gifts. 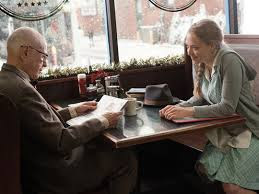 He has a good relationship with his grandfather, Bucky, who for the last five years has frequented the same diner and has had the same waitress, Ruby (Seyfried), who he’s become friends with. When he finds out that Ruby will be alone on Christmas, he brings her to his daughter’s for the holiday. Eleanor Cooper (Wilde) is dreading the holiday most of all. She believes that she’s there only to disappoint her mother, and avoids going home by hanging out in the airport bar, where she meets Joe (Lacy), and a soldier in the Army, who has been stranded at the airport because of bad weather conditions. As the two of them hang out, Eleanor hatches a plan and invites Joe home with her as her boyfriend. Emma (Tomei), Charlotte’s sister is the family screw up. Always late and unorganized, she is arrested at the mall for stealing a broach that she planned on giving to Charlotte for Christmas. After pleading with the police officer during the car ride to the police station, Emma realizes that she can use her life experiences and tries talking to the officer about his life. Each member of the family certainly has his or her issues, and as the family goes through the motions of Christmas Eve dinner, the bickering, the disappointments, the lies, the secrets, and the regrets all come out, when one member of the family is rushed to the hospital. 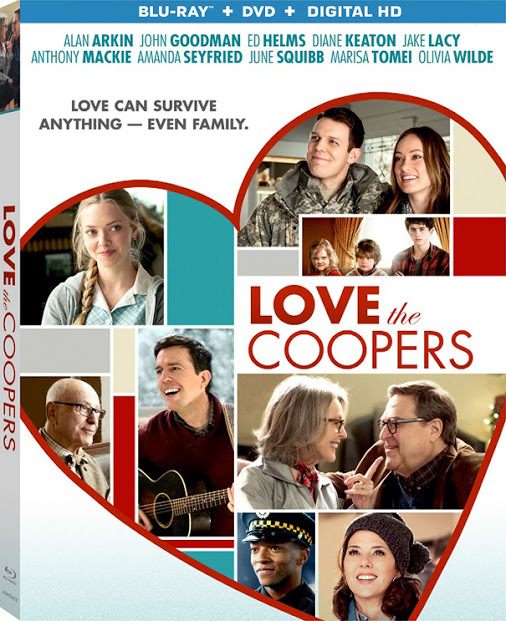 When Love the Coopers was in theaters, I was unsure about seeing it. After watching it on Blu-ray, I wish I’d have seen it in theaters. It is a sweet family-centric film that shows a realistic family, their issues and what holidays are like for many families around the world. 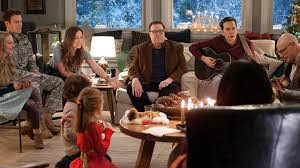 No family is perfect, and Love the Coopers shows that through comedy and realism. All the actors in this ensemble cast were great, and I thought that John Goodman and Diane Keaton were perfect as Sam and Charlotte Cooper. Olivia Wilde was wonderful as Eleanor, who was a bit sarcastic, self-deprecating, and who suffered from “foot in mouth disease.” The cast was great together and the story, while fractured, showed each family member’s journey to the realization that no matter how bad life is, your family is always there for you. Love the Coopers’ 1080p High Definition video presentation is pretty good. The picture is clear and sharp and scenes transition well. Colors are good and everything looks realistic. Flashbacks, memories and reflections were just as sharp and the Christmas lights were warm and inviting, as you would expect them to be. The English Dolby Digital 5.1 DTS-HD Master Audio soundtrack was also very good. Volume levels were even and all the dialogue was intelligible. I loved the narration throughout the movie and it came at just the right moments without being intrusive or detracting from the rest of the dialogue or background music. Love the Coopers also included English Descriptive Audio and subtitles in English SDH and Spanish. The special features, while short, were cute. I wish there was more about the dog and more fun on the set, but I enjoyed what was included. The music video is sweet as it interweaves the song and scenes from the movie. Meet the Coopers (12:12) – Behind-the-scenes with the Cooper family, told through interviews with the cast and crew and scenes from the movie. Rags the Dog (1:16) – A quick look at how significant “Rags” was for the movie. Fun on Set (:54) – The fun with the cast and crew and filming the movie. Music Video by Alison Krauss and Robert Plant (3:21) – “The Light of Christmas Day” music video. 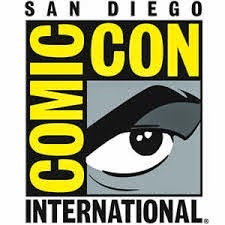 Trailers (13:36) – All the previews form the beginning of the disc. 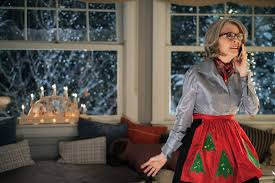 Love the Coopers is a sweet movie that is sure to tug at your heartstrings. I really enjoyed it and will definitely add this to my movie rotation. The individual stories are interesting and the way the story comes together is really good. I found myself rooting for the Coopers and hoping that it all works out. 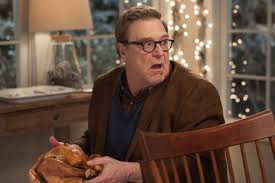 Love the Coopers is one of those movies that I’d like to have seen a “what comes next” flash forward, because I really became invested in the family and wanted to get to know them better.